Eggs ‘n Things Japan has revealed its new Fondant Chocolate Pancakes which will be served for a limited time from January 16 to February 28. 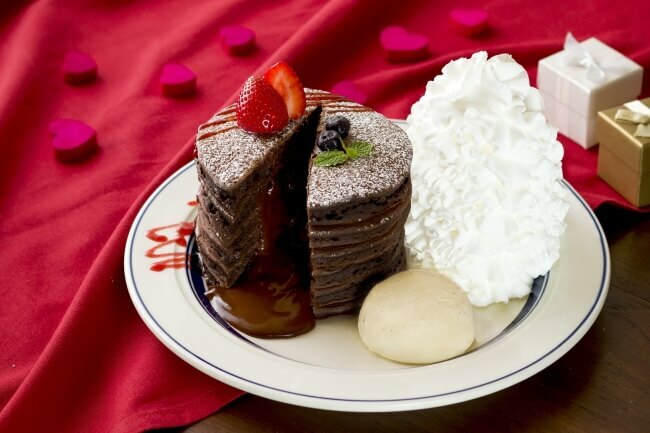 Plates are piled with a stack of 6 thick chocolate pancakes which are filled with a rich raspberry ganache. They are also served with a dollop of vanilla ice cream and a huge tower of whipped cream to complement the chocolate. This is a must-eat on Valentine’s Day. Whether it’s a treat to yourself, a friend or that special someone, don’t miss out on this very special treat.